Our Midtown location provides both Assisted Living and Memory Care apartments. Located in downtown Phoenix off of Indian School Road on 3rd Avenue, BridgeWater Assisted Living Midtown campus is a stunning seven-story community that’s both modern and stylish, and boasting beautiful mountain views while surrounded by the lively downtown activities. The attractive interior décor features fine furnishings, local art and many other elements reminiscent of historical Phoenix. The apartments and common areas are spacious and loaded with high-tech amenities and quality details. Our location is just a short distance away from the Light Rail, restaurants, shopping, sports, museums, the theater, churches, healthcare services, and much more. We’re also creating opportunities for residents to engage in local community events, give back through philanthropic projects, and participate in local civic affairs. 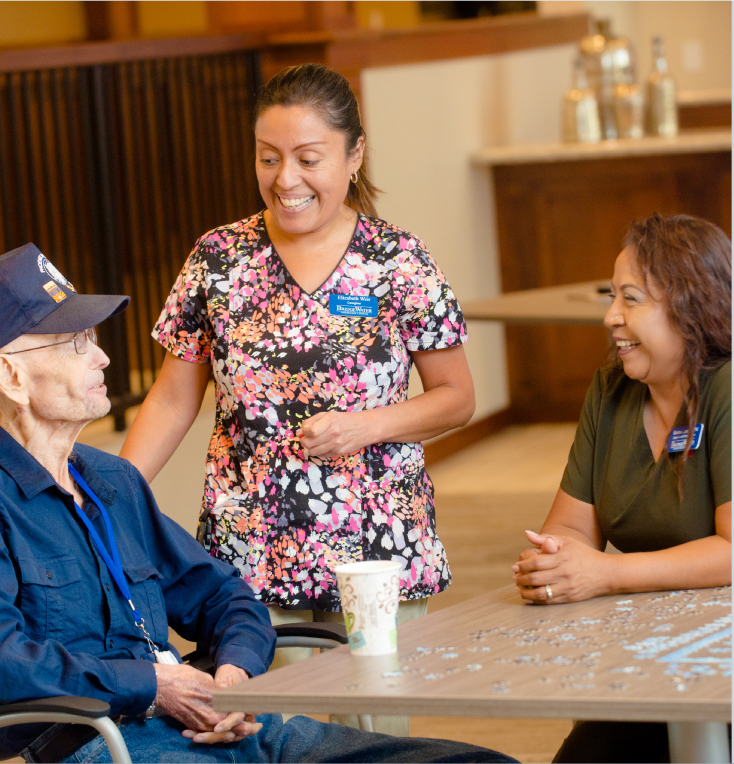 Our residents are as independent as they want to be. They can choose to attend a local play, go to a museum, dine in at our restaurant or go out for a meal with friends. Care level includes care staff to provide assistance with activities of daily assistance as needed which includes; assistance with bathing, dressing, grooming as needed. Assistance with medication management, orientation and redirection as needed. Assistance to meals and activities. The community will provide healthcare evaluations, service planning and health monitoring as required by Arizona State Licensing. General health monitoring. Resident is independent with all activities of daily living and is able to take medications without supervision. The community will provide clinical oversight including; healthcare evaluations, service planning and medication oversight as required by Arizona State Licensing. General health supervision with the care teams ability to intervene as needed. The care team will provide medication management twice daily, healthcare evaluations, service planning and Supervisory oversight and health monitoring as required by Arizona State Licensing. The care team will provide daily assistance with activities of daily living as needed. Includes; assistance with bathing twice weekly, daily dressing and grooming, orientation and reminders to attend activities, medication management three times daily, healthcare evaluations, service planning and health monitoring as required by Arizona State Licensing. The care team will provide daily assistance with activities of daily living as needed. Includes; assistance with bathing as needed in excess of twice weekly, daily dressing and grooming, polypharmacy medication management, orientation and reminders to attend activities, escorts to meals and activities. Healthcare evaluations, service planning and health monitoring as required by Arizona State Licensing. Every BridgeWater Assisted Living apartment is equipped with GreatCall Technology™ proactive technology. This exciting technology is designed to improve wellness outcomes for our residents by allowing our care teams to ‘see behind the door’ in a manner that is private and non-invasive. GreatCall Technology© provides a wide range of clinical data that helps our staff deliver better care to our residents. Careful monitoring of data allows our healthcare team to proactively identify emerging health concerns, and quickly address them with less downtime and better outcomes for residents.